According to those who are supposed to know the ins and outs of rock’n’roll history – this is an uninspired album not worth paying attention to. According to us here at The Calming Seas it’s a lost gem. The Mamas & The Papas were the sound of a Southern California pop industry soap opera ten years before Lindsey Buckingham and Stevie Knicks joined Fleetwood Mac. They personified the aura of Laurel Canyon. Almost-too-perfect harmonies was combined with simple and witty melodies and the result was brilliant pop songs like Creeque Alley and Go Where You Wanna Go. The history of the greatness and success of The Mamas & The Papas is sweet but short. The breakthrough single California Dreamin hit the charts in November of 1965 and by the end of the summer of 1968, the band was no more due to conflicts, ego and personal ambition. But The Mamas & The Papas were not allowed to rest in peace. They were forced back to life in 1971 by a threat from Dunhill Records that unless the band released another album to commit their five album record deal (the band released four albums from 1965 to 1968) the members were to be sued for $250 000 each. 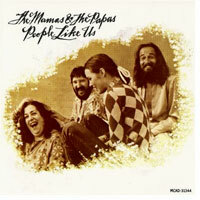 The result of that turn of events is this album, People Like Us from 1971. It’s not hard to figure that a situation like the above mentioned may be somewhat suffocating to a creative process but the resulting album is actually very interesting – and quite good. It’s sort of a schizophrenic mix between the enthusiasm of the first four Mamas & The Papas albums and the very bleak mood which occupies The Wolf King of LA – the first solo album by lead songwriter for the band, John Phillips. Songs like Blueberries For Breakfast and People Like Us brings the song writing of soft-rock king Roger Nichols (from Roger Nichols and a Small Circle of Friends) to mind. The Caribbean sounding European Blueboy is somewhat of a mystery on the album with its very laid-back feel and sort of smooth-but-freakish sounds. Snowqueen of Texas is genuinely beautiful song and actually one of the best ones in The Mamas & The Papas catalogue. The whole album has a very mystery mix of smooth sadness, bitter sunshine and naïve despair.